A loooong time ago when we were first married, G-Man and I lived in a town far, far away . . . well, not so far, really. G-Man was a cute red-headed pharmacist when I met him, and about a month after we married (which, really, wasn’t long after we met) we moved to Bartlesville, Oklahoma. He worked for a firm opening a new pharmacy in town, and I managed the junior department in a big department store. 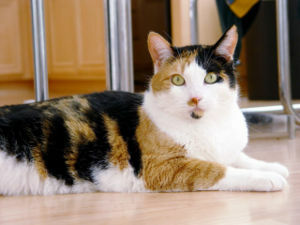 We lived on the other side of town in a pretty little house with a big, fenced backyard for our dog, a beautiful, lemon colored basset hound named Rex, and our calico cat, Kitty Kitty. 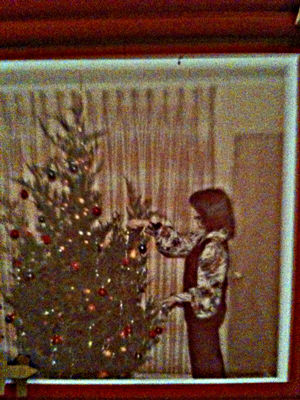 That year after much discussion, we had a “real” Christmas tree. G-Man’s family always bought pine trees, mine always went out and cut a cedar, so for many years we traded back and forth. One year pine, the next cedar. When I’d finished everything else, I always put icicles on the tree. Icicles were those tiny strips of silver (like flimsy tin foil) that we draped over the tips of the branches to give the entire tree a frosted look. Okay, it wasn’t frosted looking, but it had a tiny bit of bling. Our tree was perfect–in my eyes, anyway. I hoped he meant he watered it. Ha. “What was wrong with it?” After all, I’d decorated by myself. He was criticizing my handiwork. Fat clumps of silver weighed down some of the branches where delicate wisps of delight had previously floated near the tips. I don’t remember being particularly pleased (I might have cried something like, “You ruined it!”) but that part of my memory isn’t clear. Anyway, we were going to dinner with some friends from work and G-Man wanted me to open my gift from him before we went. Now, I love surprises on Christmas morning so much that as a kid, I never, ever tried to find presents before the big day. But as he pointed out, I really didn’t have anything to wear since I’d lost some weight our first six months we were married. My heart was heavy at the prospect of no surprise on Christmas morning, but I opened it. He’d bought me a beautiful wool pantsuit. I had a great new haircut and felt like a million dollars on our date. When Christmas came, I decided to focus on what I’d bought him and the critters rather than bewail the fact that I had nothing under the tree. I gave G-Man his gifts. 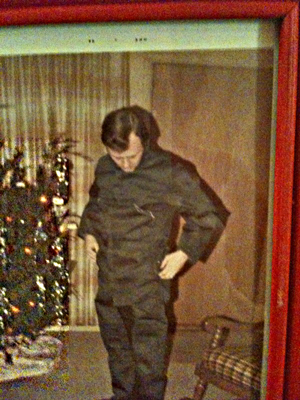 I don’t remember what small gifts he got, but Santa brought him insulated overalls to wear when he rode his motorcycle. Now . . . how about you share your first-Christmas-after-you-were-married memory with me? Categories: Small World Christmas | Tags: Bartlesville, basset hound, calico cat, Christmas, Christmas Tree, Decorating, Holidays, icicles, Oklahoma, Santa Claus | Permalink.